WORCESTER, Mass. - Having already suffered two defeats at the hands of Mid-Wach B rival Nashoba, Westboro decided to play Thursday night's Clark Basketball Tournament semifinal against the Chieftains with no worries or reservations. "We basically decided that all the pressure was on (Nashoba)," Westboro coach Brian Willar said. "They're the ones that have to beat us a third time, they're the defending (Clark Tournament) champions." While Westboro (14-7, 3-5 Mid-Wach B) may have been relaxed, the Rangers certainly weren't low energy. 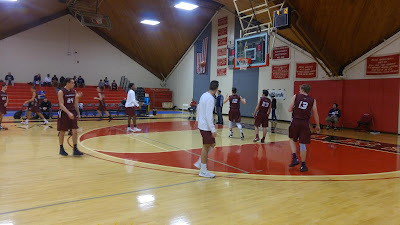 Westboro got to the line against Nashoba (17-4, 6-2 Mid-Wach B) an astonishing 31 times, connecting on 24 free throws, and fought the older, larger Chieftains to a 30-30 tie on the boards. It was that energy, plus the outstanding play of sophomore twin brothers Mike and Matt Doherty, which helped Westboro pull away from Nashoba, 68-41, and advance to Saturday's tournament final. The game actually started similarly to the previous two contests, with the Chieftains using their size to push out to an early 9-2 advantage, but Westboro's aggressive defense and offensive slashing eventually turned things around. When the Rangers couldn't hit a shot from outside, Mike Doherty's ability to get to the line kept the Rangers afloat. He scored his team's first six points, and finished the game with a game and career high 24, to go with his brother Matt's 13 points, and active center Vinny Rosa's 10. Westboro's aggressive play on both ends also got Nashoba center Connor Ojerholm into early foul trouble, opening up space in the lane for the Rangers to work. "Coach said get to the basket and get their bigs in foul trouble," Mike Doherty said. "We did that for number 50 (Ojerholm), so it opened the paint for us. Then, when they started clogging it, we started hitting our jump shots." A 42-33 Westboro lead at the end of the third quickly became a blowout as the Rangers outscored Nashoba 26-8 in the game's final period, including a 20-2 run over the last six minutes. During that run, Westboro was also aided by some dead-eye shooting from Jake Hughes, who buried a long three, then knocked down four free throws, before tipping another basket home to put the game far our of reach. "We just wanted to be the more aggressive team (Wednesday)," coach Willar said. "I thought we showed that, and that was the key for us." For defending Clark Tournament champion Nashoba, it was a disappointing night, but certainly a testament to the depth of Mid-Wach B. Along with these two teams, the league also boasts Groton-Dunstable, who lost Thursday night to Bartlett in the tournament's other semifinal game, and state title contender Marlboro. The Chieftains simply couldn't hit an outside shot tonight, and never quite adjusted to some quick whistles from the game's officials. The Chieftains will now turn their attention to the state tournament, more specifically the Division 2 Central bracket, which will be released this weekend. For Westboro, it will be another game at the Clark, as the Rangers are set to face Bartlett this Saturday at 6 pm. "It's great, I've got to tell my older brother," Mike Doherty said. "I don't think he's ever been in the (Clark Tournament) finals, so he'll be pretty jealous."